Were any covers postmarked on the launch day of Sputnik (4 Oct 1957)? I've seen covers postmarked on anniversaries of the launch, but can't recall ever seeing any that were postmarked on the actual launch day. Also, can anyone give an estimate as to how much one of these covers would go for, if they exist? The USSR postal agency, KNIGA, produced some backdated covers with the Oct. 4, 1957 postmark. 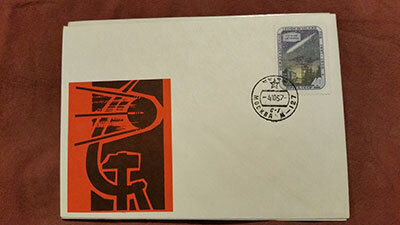 To my knowledge, there are no Russian covers legitimately postmarked for the Sputnik launch. There was a town in Arkansas (the town name escapes me right now) where some covers were postmarked on the Sputnik 1 launch date. These are pretty popular with collectors since they were legitimately postmarked the day of launch, albeit on the other side of the earth, in a city unrelated to the space program. I haven't seen one of these sell for many years, so cannot give you a good price hack on them. As commented earlier, find a scan of the Summers, Arkansas, space event cover for Sputnik I in Earth orbit and cancelled on the launch date of the first USSR orbital satellite, October 4, 1957. The cover is unusual in that this USA cover is a legitimate space event cover for the launch of this first Soviet space satellite. The event stunned many people who thought the USA's space program would be the first to achieve this distinction and honor. For many space cover collectors worldwide, this singular event is the start of the modern Space Age. I picked-up the Summers, Arkansas Sputnik I cover on eBay earlier this year for $38. Surprisingly, a companion cover for Sputnik 2 came in at $54. So, if you average the two prices and include shipping and handling, the valuation works out to be $48 per cover. Only a small number of Summers covers for these early space events are believed to exist. The backdated USSR club covers previously discussed in an earlier posting are generally found in the same price range. I hope this answers your question about Sputnik I. — Steve Durst (and also a Steve who collects space covers). Thanks to both of you for the replies. You've been most helpful! Oct. 4, 1957 was Friday. Thus thousands if not millions of cards and letters were posted throughout the whole Soviet Union. It still should be possible to find one of them with the aid of a Russian friend. By the side: There are two hours time delay between Moscow and Cosmodrome Baikonur. In Baikonur it was already Oct. 5, 1957. In my collection I have a commercial letter to Germany which was posted in Moscow on Oct. 5, 1957 — the closest I found without too much search. I was going to show my signed Sputnik 1 cover from Summers, Arkansas and had it ready to post when I found the copy that Steve posted. But I'd like to attach it and a backdated Kniga cover to this. Sputnik 1 was secretly launched from the Baikonur launch center in the USSR. News was not released until after this first artificial satellite had made one full Earth orbit. This was the world's first launch into space. 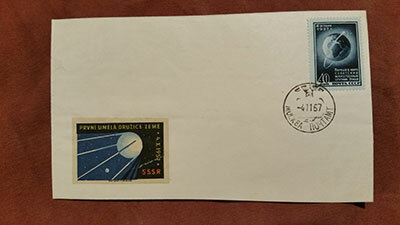 The only covers that exist, applied on the correct date of 4 October 1957 on which Sputnik 1 became the first man-made satellite to fly over the United States, were a small handful of possibly fewer than 20 postmarked from Summers, Arkansas. The first Soviet "club cachets" for Sputnik 1 were not released until the second anniversary. This cover bears a mimeographed cachet which was a first for space covers and this collector views it as an "event" cover for the first time that an artificial satellite orbited over the United States. The signature (which appears to look like a "B") is the entire signature of Georgi Grechko. He was a graduate student working for Korolev and was tasked with calculating the orbit and the amount of fuel necessary to place the satellite in orbit. Here is the Arkansas Sputnik 1 cover. The Kniga Sputnik 1 cover shows an October 4, 1957 date from Moscow, but the stamp on this cover was not issued until November 5, 1957, leaving no doubt that the cancel was backdated. That leaves the Arkansas Space cover as being the only one prepared for this event, which I see as the first time that an artificial satellite flew over the United States. An October 4, 1957 dated cover from the USS Lake Champlain was featured in SCOTW 74, back on September 12, 2010. A Sputnik Summers AK cover sold on eBay Thursday for US $15.50. I just found two plain, uncacheted covers on eBay, that are postmarked Oct. 4 1957. One is from Day, Missouri, and the other is from Chester, Minnesota. Both are addressed to a Leon Thompson in Sorrento, Maine. They only cost me $8 each. All these covers are backdated. Sputnik was launched 10.28PM Moscow time. In a dozen of minutes it started to communicate its famous "Bip-Bip". TASS transmitted the announcement around midnight. So no Soviet covers could exist with cancellation at Oct 4. On 4.10.1957 a huge amount of letters were posted throughout the whole Soviet Union. Thus letters and coards with this date should exist. Keep in mind: When Sputnik was launched it already was October 5th at Baikonur launch site. In this case we can say that any cancellation with particular date is commemorating the event. But this is not our case. NO dedicated Sputnik covers or cancellations exist for 4.10.1957. ...in US, the news spread only on the Oct 5 — half a day after, this means, once again, no covers for Oct. 4 could exist. News of Sputnik's launch and orbit hit the newswires in Washington, D.C. at about 6 p.m (Eastern) on Oct. 4. It went out on TV and radio soon thereafter and by 8 p.m., NBC was broadcasting the signal from Sputnik on both TV and radio that night. That means there would have been ample time on the west coast (some 3 hours earlier) for covers to be postmarked. Even in Summers, Arkansas, where it was an hour earlier, there still could have been time for postmarks to be applied, depending on when the post offices closed. Theoretically yes, but what about the image of Sputnik? It appeared first on Oct 5. Many covers had their cachets added later. For example, the 1962 Project Mercury stamp was issued by surprise, and so all of the covers postmarked that day were done without cachets; they were added later. Adding a cachet does not imply backdating. This is new to me, as am not very experienced collector. Just in case, I found information that the first images of Sputnik were released on Oct. 9, 1957. The article in Pravda and TASS announcement on TV Oct. 4-5, 1957 did not include images. I am checking this issue with Russian colleagues. Yes, according to the Associated Press, the first official photo of Sputnik was released by TASS on Oct. 9, 1957. The AP wire, citing Moscow Radio, on Oct. 4 however, included a description of the satellite as "silver in color, weighed 184 pounds [and] was about the size of a basketball." The Summers covers mention that the cachet was based on a TV news feature. The networks did create unofficial representations of Sputnik prior to the photo release on Oct. 9. For example, here's an Oct. 6 CBS broadcast that included a crude model and animation. So it's possible the cachet was based on an early artist's concept or was created and added after the first photo release on Oct. 9. Either way, it doesn't necessarily call into question the postmark. I understand the point. Thanks! Ray Cartier (aka cvrlvr99 here) has an excellent article on this subject in the July 2015 American Philatelist magazine. Congrats Ray! MMMM... that's great! Can you please refer the less experienced colleagues to the article? Astrophilately is seldom a subject in the magazine, so this is really a special article in that sense, as well as being well-written. Dennis, APS magazine for July 2015 is not yet out or on their website. Is this the correct issue for Ray's article? My copy arrived today. Great article Ray! For our European colleagues - I have just sent the same article that was printed in The American Philatelist magazine to Jeff Dugdale of the Astro Space Stamp Society in the UK. I told him that since it has had little exposure to astrophilatelists, he could print this in Europe if he wants to do so. So you may have an opportunity to see it there. APS' website now has the July 2015 issue available to members. Printed off a copy for reference. 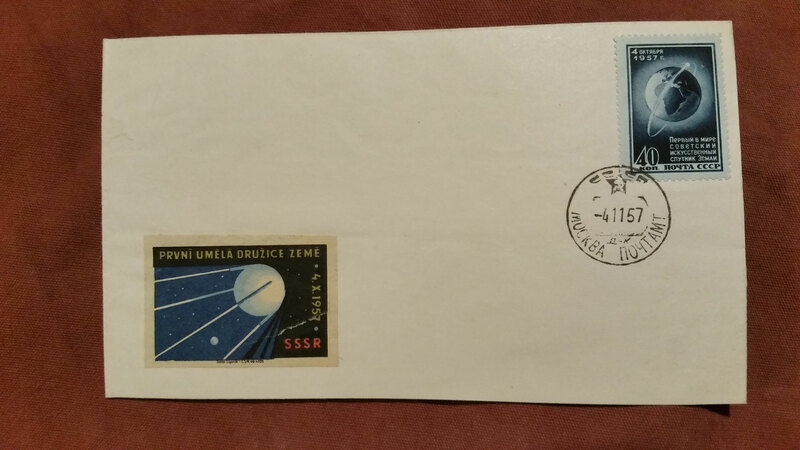 I purchased this Sputnik 1 cover postmarked 4 October 1957 some time ago (maybe a year ago?) from the well-known Gabi Leidig in Germany. There was a lot of interest in it! It seems to have been posted in Moscow on 4 October 1957 and, as such, heralds the beginning of the Space Age. The stamp also seems to depict the stars and, maybe, a comet? Can anybody out there translate what it says? The symbol to the left is a sticker, undoubtedly added at a later date. The second cover is (almost) a Sputnik 2 launch cover also with a sticker in the lower left of the cover. If anyone can throw further light on these covers it would be very welcome. Very nice! That is an early Soviet astronomy stamp on your Sputnik One cover. Unofficially commemorating the 10th anniversary of the Sikhote-Alin meteorite that fell in eastern Siberia back on February 12, 1947, it was one of a two stamp set. The other, mostly yellow, shows a large telescope inside an observatory. These were released to commemorate the "International Geophysical Year 1957-1958" as noted around the perimeter of both stamps. About a month after my article in the APS Magazine, I saw one of the Summers, Arkansas covers sold on eBay for $137.